As I sit here typing this post London Eye wedding photographers, and taking a break from editing some of Natalie and Max’s images, I’m reflecting on what a busy but fantastically exhilarating week it has been. Three central London weddings and one at Luton Hoo in the Bedfordshire countryside, that’s four weddings but thankfully no funerals! Although I knew we had photographed at some of the churches featured in the film, Paul the groom informed me last Sunday that his venue Luton Hoo itself was used for one of the scenes. We are collecting famous venues! The last week has taken in such iconic London landmarks as Tower Bridge, The Gherkin, Lloyds building or the “inside out” as some call it, Leadenhall market, Big Ben and St Pauls. There was sunshine, there was cloud, and there was rain. but throughout it all there was fun and creativity aplenty. 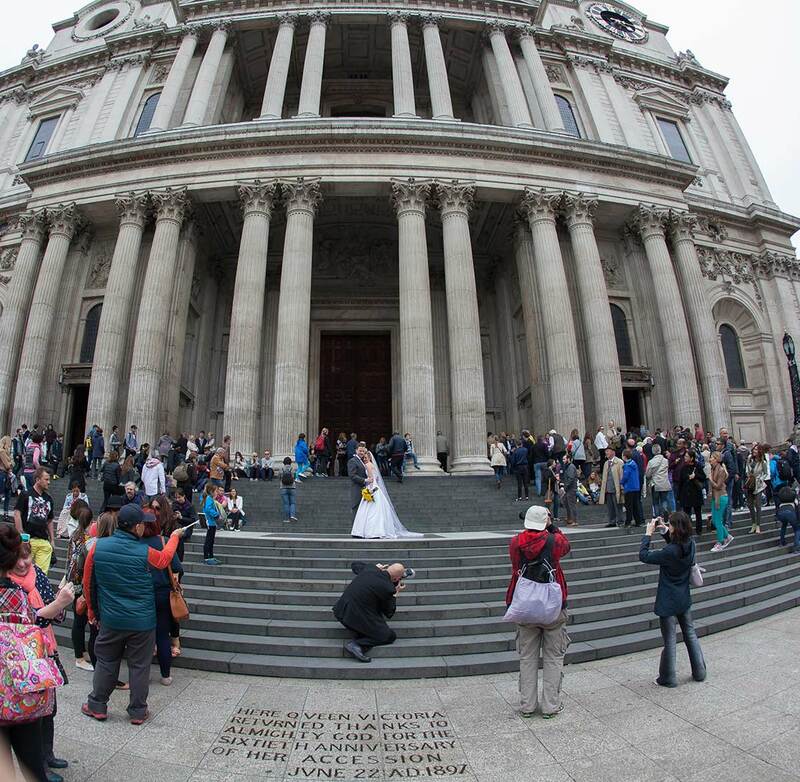 Every now and then we take shots of ourselves at work, and here is one below taken by Joanna that features me photographing Andrew and Jill on the steps of St Pauls from this Saturday just passed. What made it truly special and memorable for the newlyweds was the fact that all the tourists around them continually whooped and applauded. It felt pretty special from our end too, and it is one of those pleasures we can relive as we work on their’s and the other weddings we have had the privilege to photograph in the last seven days. The first few years of our ten years as wedding photographers we did a great many weddings around the home counties, and just the occasional wedding in central London. Now we still love a country wedding, but we have to be honest, a central London wedding is more challenging and therefore to us more exhilarating. London is probably one of the most photographed cities on earth, and one of your challenges as a superior photographer is to create striking images that are more than just tourist snap shots. It is the easiest thing in the world to plonk a wedding couple in front of a landmark and take pictures. But anyone could do that with an iPhone or a reasonably priced DSLR. So in that case you might as well hire a friend to do it for you if that’s what you need! What you are paying for in a professional is someone who understands lighting, direction, camera technique coupled with with excellent equipment, and the ability to create a “moment.” And in a central London wedding you have to create that surrounded by city workers and tourists. You have to think and act fast while all the time showing a relaxed persona, and in the average twenty to thirty minutes maximum wedding photography time that you get, well, you MUST get the shot! It’s the same with a country wedding of course, just take away the city workers, tourists, traffic, dodgy geezers with one eye on your equipment and so on and so on. So in reality, it is completely different! No wedding photographer with a London eye! P.S. If we are available no home counties or other weddings turned down!